Quincy, Massachusetts, has had an annual Flag Day parade since 1952 and claims it "is the longest-running parade of its kind" in the U.S. The largest Flag Day parade is held annually in Troy, New York, which bases its parade on the Quincy parade and typically draws 50,000 spectators. In addition, the Three Oaks, Michigan, Flag Day Parade is held annually on the weekend of Flag Day and is a three-day event and they claim to have the largest flag day parade in the nation as well as the oldest. In Washington, D.C., Flag Day is celebrated heavily through the 7th and 8th Wards of the city. It is said that Clyde Thompson is the "Godfather of Flag Day". It is tradition in these wards to slow smoke various meats and vegetables. For Flag Day 1942, President Franklin D. Roosevelt launched an international "United Flag Day" or " United Nations Day", celebrating solidarity among the World War II Allies, six months after the Declaration by United Nations. It was observed in New York City as the " New York at War" parade, and throughout the United States and internationally from 1942-1944. The week of June 14 (June 10–16, 2018; June 09–15, 2019; June 14–20, 2020) is designated as "National Flag Week." During National Flag Week, the president will issue a proclamation urging U.S. citizens to fly the American flag for the duration of that week. The flag should also be displayed on all government buildings. Some organizations, such as the town of Dedham, Massachusetts, hold parades and events in celebration of America's national flag and everything it represents. ^ a b c d e f g h i Gammage, Jeff (June 14, 2008). "Flag Day loses importance but lives on in Phila". Philadelphia Inquirer. Archived from the original on June 20, 2008. Retrieved June 14, 2008. ^ Wright, Jr., Robert K. (1983). The Continental Army. Washington, D. C.: Center Of Military History, United States Army. LCCN 82016472. ^ "June 14th: The Birthday of the U.S. Army". US Army History. U.S. Army Center Of Military History. Retrieved June 14, 2011. ^ "Legislative Information - LBDC". New York State. ^ "Contact Us". Fairfield Flag Day. March 15, 2009. ^ "Appleton Flag Day Parade Home". Appleton Flag Day Parade Committee. ^ "City of Quincy". City of Quincy. ^ "Real Estate Hotels Attractions Events Weather Map Pictures Business Directory". Troy NY.com. ^ "Three Oaks Flag Day History". Three Oaks Flag Day. ^ Brown, James L. (2001). The Real Bernard J. Cigrand: The Father of Flag Day. Waubeka, Wisconsin. ^ a b "Bernard J. CiGrand". National Flag Day. Archived from the original on June 11, 2004. ^ Robinson, Marilyn; Schielke, Jeffery D. (1998). John Gustafson's Historic Batavia. Batavia, Illinois: Batavia Historical Society. pp. 378–9. ^ a b "History of Flag Day". ^ a b c "About: Flag Day". BPO Elks of the USA. August 26, 1997. Archived from the original on February 20, 2008. ^ Dray, Philip (2011). There Is Power in a Union: The Epic Story of Labor in America. New York: Doubleday. pp. 328–9. ISBN 978-0307389763. ^ "Franklin D. Roosevelt: Radio Address on United Flag Day". www.presidency.ucsb.edu. June 14, 1942. Retrieved September 7, 2017. ^ "Allied Banners Are Flag Day Feature". Billboard. June 20, 1942. p. 52. ^ "1846: California's Bear Flag revolt begins". History. Retrieved June 14, 2017. ^ Kallen, Christian (June 15, 2013). "Raise the Bear Flag on Sonoma's Big Day". ^ Office of the Press Secretary (June 14, 2017). "President Donald J. Trump Proclaims June 14, 2017, as Flag Day, and this week as National Flag Week". whitehouse.gov. Washington, D.C.: White House. Retrieved June 15, 2017. ^ "White House Press Office". National Liberty Alliance. United States: Blogger. June 14, 2017. Retrieved June 15, 2017. 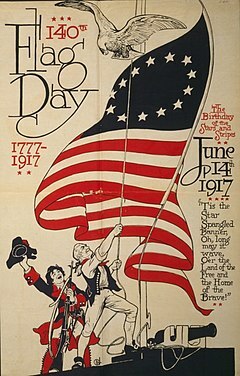 Wikimedia Commons has media related to Flag Day (United States).